Welcome to the AFP Nova Scotia Chapter! The Association of Fundraising Professionals (AFP) represents more than 30,000 members in 230+ chapters throughout the world. The association fosters development and growth of fundraising professionals – promoting high ethical standards in fundraising and working to advance philanthropy through advocacy, research, education, and certification programs. The Nova Scotia Chapter is a volunteer-run organization dedicated to advocacy, education and upholding ethical standards on behalf of the membership and the philanthropic community of the Maritimes. 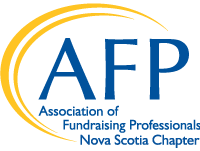 With a membership of more than 125 fundraising professionals, volunteers, students and allied professionals, AFP Nova Scotia aspires to further educate, inspire and AFP members are better able to serve their profession and the public. Explore our site to learn more about who we are, how we advance philanthropy in Nova Scotia, and how you can benefit from being part of our organization. AFP Nova Scotia Launches New Website! The majority of our content is now accessed by our members on mobile devices. Our new website is designed with this in mind. Feel free to explore our new sections as well as continue to access previous AFP content. As we transition to our new website, we appreciate your patience as we strive to deliver the best experience possible and increase your membership value. Your participation in the Every Member Campaign allows the AFP Foundation for Philanthropy – Canada to create sector advocates through education, build philanthropic leaders through scholarships, strengthen the sector through career mentoring, foster understanding through research and ensure materials are available to our members in both official languages.